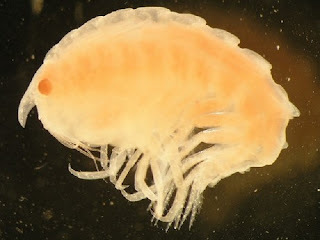 The pleustid amphipod Incisocalliope aestuarius. Photo by Marco Faasse. 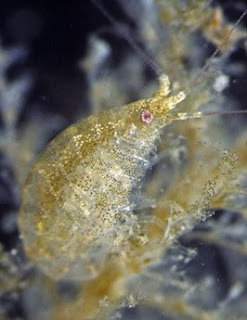 The Pleustidae are a family of marine amphipods, distributed around the world. However, despite their seemingly cosmopolitan distribution and abundance, it has been surprisingly difficult to find information about this family online. Pleustids are one of the many families in the largest of the amphipod suborders, the Gammaridea (gammarideans include the sandhoppers and other sandhopper-looking crustaceans that are what most people think of when they think of an amphipod). Gammaridean interrelationships are a great tangled mess, and in many places fall into a state that we scientists technically refer to as "buggered beyond belief". Only slowly are researchers beginning to draw some sense out of things, and they'll probably be at it for a long time yet. For those who wish to track them down (for the most part, I haven't seen them), the main revisions of Pleustidae were published by Bousfield & Hendrycks (1994 and following) in Amphipacifica*. Stock (1986) (who very tentatively assigns three oddball stygobiotic species from Japan to the Pleustidae) gives the defining characters of the family as "the rudimentary condition of the accessory flagellum of the first antenna, the biramous third uropod (rami lanceolate), the elongate telson, the weak and more or less similar gnathopods 1 and 2, and... the bilobed condition of the labrum". Bousfield & Hendrycks (1994, 1995) divided the family into a number of subfamilies. *The short-lived journal Amphipacifica ended up with three volumes published between 1994 and 2001 (I haven't found any indications that a planned fourth volume ever made an appearance). While I haven't found a complete contents listing, it appears that most (if not all) articles had the chief editor, Edward Bousfield, as author or co-author, and the majority were on amphipod taxonomy. Perhaps unjustly, the journal is not remembered for its contributions to crustacean systematics as much as it is for Bousfield's perhaps unwise foray into vertebrate taxonomy. Yes, this was the journal that saw the publication of the infamous Bousfield & LeBlond (1995), and the name Cadborosaurus wellsi - a paper so controversial that two of the journal's editors promptly handed in their resignations in protest. For more details, see Darren Naish's 2006 review. Not having the resources on hand to give you a a decent overview of the family (sorry), I'm just going to give you a couple of the highlights that I have been able to locate - (as it says in the title) the snail mimics and the symbiotic taxa. Pleustes panopla, a close relative of one of the snail-mimicing pleustids. Photo via here. Snail mimicry has been recorded for two pleustids, Pleustes platypa and unidentified species of Stenopleustes (Field, 1974). Pleustes platypa lives in kelp beds and mimics the marine gastropod Mitrella carinata. Mimetic Stenopleustes (it is not known how many species are involved) live in beds of Zostera (seagrass) and mimic various species of snails of the genus Lacuna. Different Stenopleustes individuals may have different colour patterns, each matching a different Lacuna species. The amphipod clings tightly to the seagrass, moving slowly to match the speed of a snail. Occassional rocking back and forth mimics the rocking movement of the snails. And while amphipods are perfectly adept swimmers, snail-mimicing Stenopleustes would only swim under extreme provocation, preferring to crawl to the other side of the seagrass blade instead when possible. Obviously, starting to swim would quickly give away that the animal was not a snail! Bousfield, E. L., & E. A. Hendrycks. 1994. A revision of the family Pleustidae (Crustacea: Amphipoda: Leucothoidea). Part I. Systematics and biogeography of component subfamilies. Amphipacifica 1: 17-57. Bousfield, E. L., & E. A. Hendrycks. 1995. The amphipod family Pleustidae on the Pacific coast of North America: Part II. Subfamilies Parapleustinae, Dactylopleustinae, and Pleusirinae. Systematics and distributional ecology. Amphipacifica 2: 65-133. Bousfield, E. L., & P. H. LeBlond. 1995. An account of Cadborosaurus willsi, new genus, new species, a large aquatic reptile from the Pacific coast of North America. Amphipacifica 1 (Supplement 1): 3-25. Cadien, D. B., & J. W. Martin. 1999. Myzotarsa anaxiphilius, new genus, new species, an atylopsine amphipod (Gammaridea: Pleustidae) commensal with lithodid crabs in California. Journal of Crustacean Biology 19 (3): 593-611. Field, L. H. 1974. A description and experimental analysis of Batesian mimicry between a marine gastropod and an amphipod. Pacific Science 28 (4): 439-447. Stock, J. H. 1986. Amphipoda: Pleustidae. In Stygofauna Mundi: A Faunistic, Distributional, and Ecological Synthesis of the World Fauna inhabiting Subterranean Waters (including the Marine Interstitial) (L. Botosaneanu, ed.) pp. 560-561. E. J. Brill / Dr. W. Backhuys: Leiden. So, do we really want to say it's a parasite of the King Crab, or would it be more accurate to describe it as a (sometimes misguided, since a few latch on to unparasitized K.C.) parasite of rhizocephalans? The only collection of Myzotarsa on an unparasitised king crab was on a female that was carrying her own eggs. So it's probably an egg feeder on either king crabs or rhizocephalans, it's just that (as I said) rhizocephalans are more likely to provide a continuous food supply. Rhizocephalan: "All yer reeprodukshun r belong to uz". Myzotarsa: "No! I eated them!" What good is it to pretend to be a snail? The snails have enough predators of their own. Field (1974) did show experimentally that fish generally did not eat the snails that the amphipods mimic. Whether the snails themselves produce a toxin or other distasteful compounds had not yet been demonstrated. Really interesting, I would have to agree. Looking at your posts and the educational articles I read here, I wonder why have not you got any published works at all! Thanks!